Mark Novak is still trying to recover from his wife's murder but he knows that he has to continue his work with Innocence, Inc. in order to use their resources to find the murderer. Novak is sent to Garrison Southern Indiana, where a small town with a large underground cave that hides many secrets of this small town. Ridley Barnes is the main suspect in a murder of a teenage girls whose body was found in Trapdoor as Ridley was the only one who could have made it to where her body was discovered. The problem is that Ridley cannot remember what happened that day and the police could never he did it, but the thought that he could have has haunted Ridley from that day. He decided to call Innocence, Inc. to help prove if he is guilty or not. But this small towns has more secrets than Trapdoor can hold and Novak is about to discover that people will go to any lengths to make sure they stay hidden. This is the second novel that I have read by Kortya and when I compared it to the other novel by him that I have read, Those Who Wish Me Dead, this book really falls short. I found that this book lacked the suspense and thrills of that novel especially when this book is being hailed as a thriller novel. I will say there are moments when Novak or Ridley was in the cave (Trapdoor) that will get some hairs standing up on your body especially if you are claustrophobic. I'm not claustrophobic but the way in which Kortya described these scenes as I said were spine tingling and made me feel uncomfortable. I think the overall mystery that Kortya presents in this book is really interesting especially when you have Ridley (the prime suspect in the murder) as the one who contact Innocence, Inc. in order to prove/disprove that he is the murderer. I just did not like the way in which Novak went about getting his information. I was not the biggest fan of the main character but I actually don't think that you are supposed to be and he's not the cool anti-hero either. He does not put private investigator in a good light. He is impulsive, uncaring, unsophisticated and often does not think his actions through to the point where everyone thinks he is crazy. He does not seem concerned about following the evidence or helping out (which he actually makes clear several times in the book). His only concern is going after those who he perceives have done him wrong since entering the small town. However, you do feel sorry for him as he continues to replay the last words that he said to his wife but that is about it, he is pretty damaged by the time that he gets to Garrison. He does grow as a character somewhat from the beginning of the book to the end, but it is a rocky road of growth, but i'm actually okay about not liking him I actually think it made the story more interesting. I felt like this book was a little too long and just dragged on to the point where I had to keep checking how close I was to the end and that is never a good thing when reading a book unless you are doing with anticipation about what is going to happen next, for me it was more like "Are we there yet?". 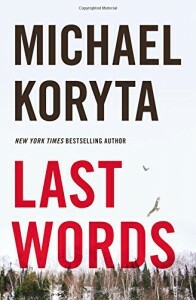 I think part of the problem is that Kortya was trying to do too much in this book, putting too many twists and turns where there did not need to be. While I did not enjoy this book as much as Those Who Wish Me Dead, I still think that Kortya is an awesome author and one that I am going to enjoy. There is a followup book hinted at at the end of this book, but right now I'm unsure if I will pick it up.